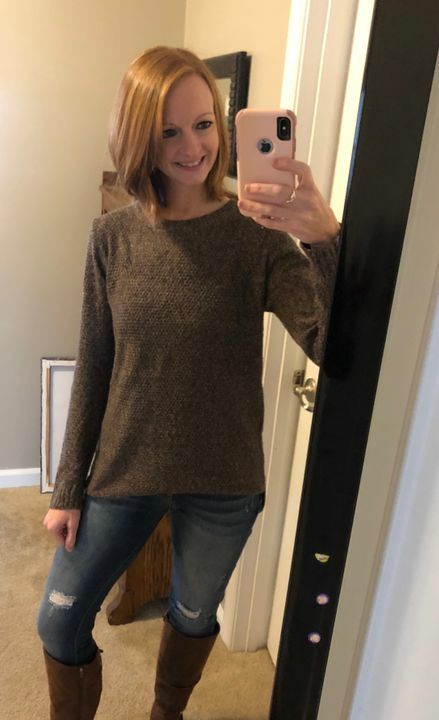 We're loving this adorable high-low, brown knit sweater! Small: Bust 42'' Front Length 26.5'' Back Length: 28"
Medium: Bust 44'' Front Length 27.5'' Back Length: 29"
Large: Bust 46" Front Length 28.5" Back Length: 30"
This is a nice basic brown sweater. The color is exactly like pictures and had a great fit. This sweater is extremely cozy. I really think the color of it is super pretty. This sweater is the perfect combination of comfortable and cute! I love the fit. This sweater is super cute! It fits true to size and I like that it’s a bit longer.